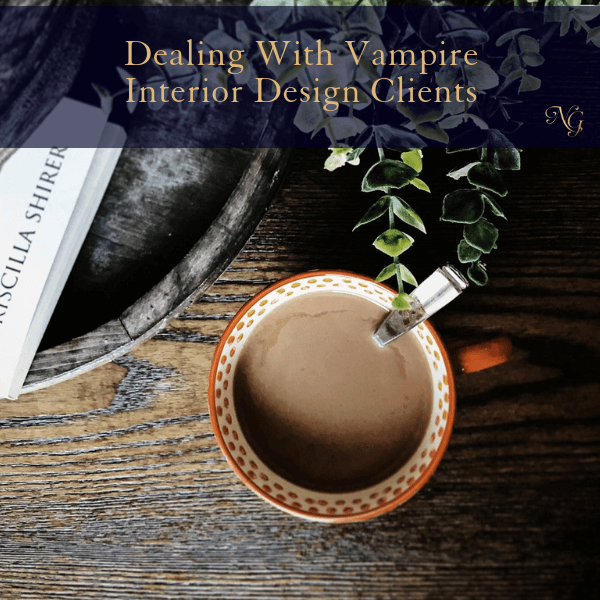 VAMPIRE interior design clients! You feel like they are out to get you! You know who they are…the ones who seem pretty decent during the initial consultation and then morph into “monsters” as the project gets into full swing! 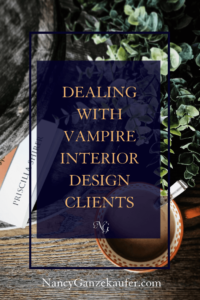 Having been in that phase of the interior design world before becoming an interior design business coach, you know I have had my share of “vampire” clients. You just weren’t ready for this level of crazy, and you feel drained before you even know how to deal with the situation. You dread every single encounter and maybe even regret signing this client on! I wish there were a foolproof way for you to avoid the “Vampire” clients completely. Unfortunately, sometimes you get them. However, as your interior design business coach, it is my responsibility to help you troubleshoot! Let me coach you on how to handle such interior design clients! First, let’s start with your disposition! People can push your buttons and send you into an emotional reactionary place you never want to go to. You must resist and remember NOT to allow them to have that much control. Difficult people are often looking for control. Seek to keep your cool and be objective. Even when they are on the verge of insanity listen and be understanding. Show that you are on their team. No, you are not a doormat. Just give them some space to vent and be caring about it, BUT THEN…. What are the FACTS you can present to refute some of those hyper rants? What was agreed upon? What is in the contract? The key is to not give in to an emotional discourse, but instead, always, always, always take it back to the facts wherever possible. People can’t argue with the facts! Ok, so have you thought about what would cause you to terminate a contract with a difficult interior design client? You have probably had a few problematic clients. What thing is a big “no, no” for you, enough that you would put it as a clause for termination? You should have 3 to 5 items in your terms and conditions that would be the reason for the termination of a contract. Employ an attorney to help guide you and make sure you have all your bases covered. At times, people tend to act better when they know what you expect from them, from the beginning! In your onboarding package, you need to be clear about HOW and WHEN you communicate! Spell out how quickly clients can expect to hear from you after an inquiry. Explain emergencies and when it would be OK to contact you outside of normal communication times. Any relatively busy business woman doesn’t have time to be answering questions all day long. So, when a client chimes in with one too many questions, nip it quickly. What you can do is plan a 30 minute Q & A time. Give that client enough space to think of ALL their questions and discuss them in one sitting. Time is money. If they want more of your consulting time, they may just have to pay for it! START A NEW ACTION PLAN? Based on what you have been experiencing and what you have talked about in your 30 min hash it out session, is there anything that needs to be altered? Is there a need for some new action plan? DO IT! Document it. Share it. Make sure you and your clients are on the same page and have him/her sign it! Do you feel a bit better now? Take a deep breath and put some of these actions into play. It does you and a demanding client good!